I also wanted to add that I had so much fun looking through all of the submissions, I'm telling you I found inspiration in everyone. Thanks so much for playing along and I hope you play in the current Color Cue! Happy almost Thursday! You know what that means...it's almost Friday, yah! I just had to take a break and participate in some challenges. Everything But The Kitchen Sink had an interesting sketch I wanted to try. 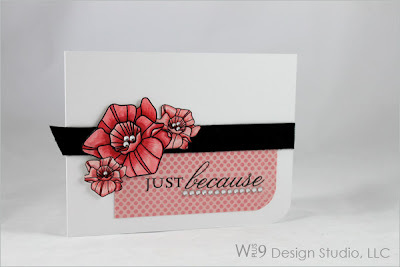 And the CARDS blog challenge this week was to use 8 colors. 8 COLORS! Now this was really a challenge for me, seriously, I finally got to seven colors and almost gave up. But you know me, I pulled out all of the stops and threw in some yellow floss! 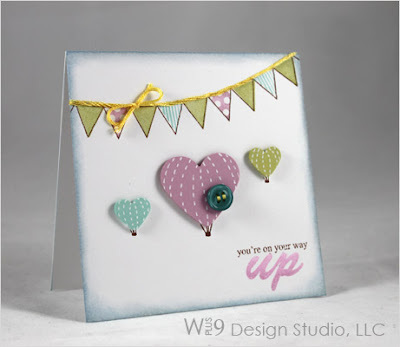 I used the Look Up set from Practicing Creativity and my Marvy Uchida heart punches to create little heart shaped hot air balloons. And I thought that the banner in the set could help me use at least 4 colors. Score! 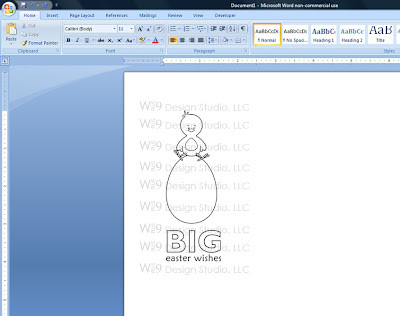 So for the scalloped edge in the sketch I used the banner...that counts, right? Did some inking on the edges in Spring Rain to represent a little bit of sky, and added a button to the center balloon. Let's see, I'm at 7 right? White, Aqua Mist, Close to Cocoa, Spring Rain, Lavender Moon, Spring Moss, and Ocean Tides. So I needed 1 more. That's when I pulled out the yellow floss and added it as the string for the banner, tied a bow, popped the button off so I could thread some through it, and voila! Done. While I love how it turned out...I don't know if I'll be trying to pull that many colors together again anytime soon. Thanks for stopping by, I hope you have a chance to make a creative mess today! Seriously, I did not want to like Copic markers, but I do. Like everyone else, I wondered if they would live up to the hype. I mean, I have some Prismacolor pencils and markers and pastels, do I really need another coloring medium? The $5-6 price tag per marker seemed too high to justify switching. So, I ordered just a few to try and I finally got a chance to play around with them. 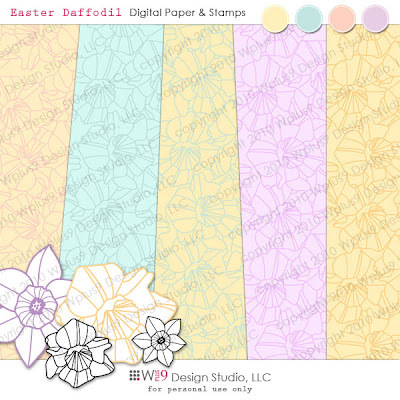 I tested them on one of the daffodil images from the Easter Daffodils digikit. Prismacolor Markers (PCM) have a harder nib than Copic Markers (CM), I prefer the softer, paint brush like feel of the CM. I found them both to lay color with equal coverage and fluidity. If you are not careful, especially on porous paper, the CM color will bleed. However, the CM markers were much less likely to cause the black edges of printed images to bleed. I found it much easier to blend colors with the CM. I also found the CM colorless blender performed much better than the PCM. The PCM blender acted much more like an eraser and removed color more so than the PCM blender. Tip: After more practice, I discovered that for me, it is easier to lay down all of my midtone color first, covering all areas. Then come back in with the shade where I want it, and blend the edges where they meet. I then come back in with the midtone and go over the blend. Last I go in and add my highlights using just the colorless blender. That way if I take away too much color, I can go over it again with a highlight color to further blend it. If you are doing flat coloring, Prismacolor markers will do just fine, but I personally prefer the Copic markers over the Prismacolor markers for blending. The Copic markers also had next to no odor in comparison to the strong odor of the Prismacolor markers. I will definitely be expanding my Copic collection, and will be sharing some more in depth coloring techniques with you all as I learn. Thanks for stopping by today and hope you are having a FABulous weekend! 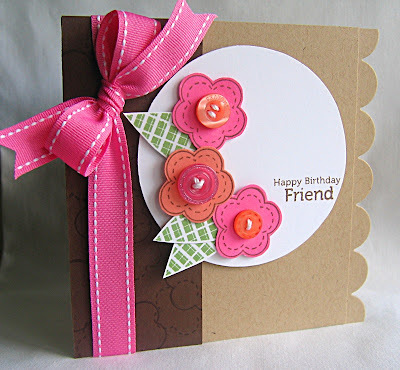 Create a card, scrapbook page, digital layout, tag, whatever...just make sure to use the above colors. (I used PTI's Stamper's Select, Ocean Tides, Lemon Tart, and SU's Melon Mambo) But anything you have on hand close to the colors will do. Sentiments or outlines in black are fine as well. You have until April 7th at 11:59 pm EST to play along. You will know the deadline has passed when the link to add your project is no longer available. 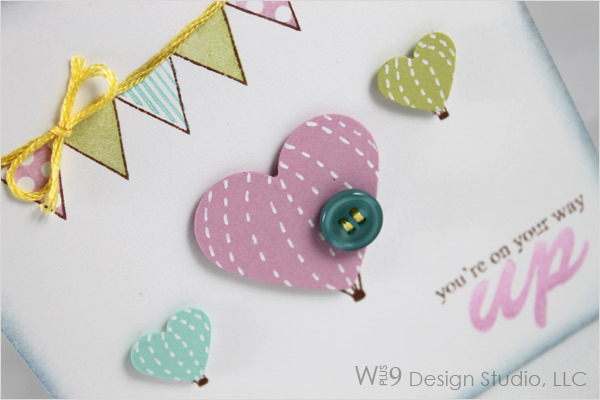 If you have Wplus9 stamps in your stash already, now would be the time to bust them out. I will be collecting lucky participants to feature in the upcoming "On Cue with Color" section here on the blog and at The Studio. If you don't have any yet...don't worry I still want to be inspired by you and you will still be featured here on the blog! 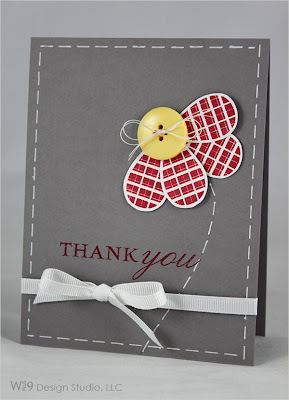 I used Funky Flower to create some fun patterned paper. 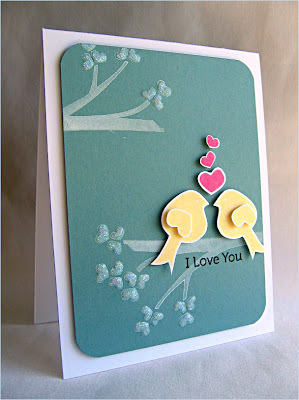 Maile Belles used Love Birds to create a love scene that just drips with sweetness. 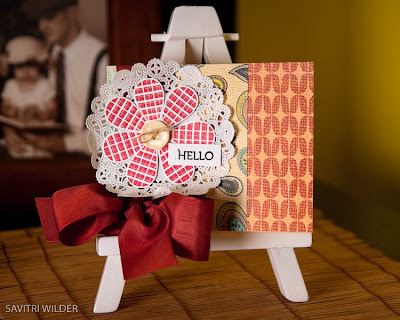 Elise Durenberger did some super fun and creative pattern stamping using Funky Flowers. 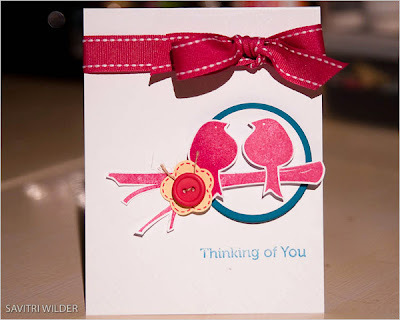 Savitri Wilder also used Love Birds and Funky Foliage to create a stunning CAS card. I just wanted to share a few quick announcements with everyone. FREE shipping for purchases $50 and over! Though I recommend Priority Mail (2-3 business days), I added the $3.00 First Class shipping for those of you that do not necessarily care for tracking and don't mind the extra delivery time. I've added US Postal Service shipping methods to our Canadian shipping options. I found the rates to be much better than the estimated rates through UPS. Both cost and delivery time will be calculated based on the delivery method you select and your total shipment weight. A great big THANK YOU to Dana for following up with me on the Canadian shipping and helping me to iron out some wrinkles. Dana can vouch for us, that we do read, respond, and follow-up with all customer service emails! I have not added these options to the store shipping information page as of yet. However, I have been working on it as promised and will continue to add countries to the list as I test each. I am very pleased to announce that we are now offering shipping to Australia! *All Canadian and International packages will be marked as commercial merchandise at sale value. You are responsible for any applicable duty or taxes that may be required for the delivery of your package. All shipping accounts are in the business name and therefore cannot be shipped as gifts**. **If items are won as a result of a contest entry, those items will be shipped as gifts. Flickr - We now have a Flickr Gallery where you can share all of your wonderful Wplus9 Design Studio creations! I encourage you to add yours, I can't wait to see what everyone has done. Facebook - Become a fan and be notified of important updates and share your thoughts. Thanks so much to those of you that participated in the Color Cue this month! I found a ton of inspiration looking through your links! I will be doing something super fun with the Color Cue's so if you haven't participated yet, you may want to start. Would you like to be featured as "On Cue with Color"? Starting with the next Color Cue (going live tomorrow), we will select 3 lucky participants to be featured on the website in the Color Cue section at www.wplus9.com! Sound like fun? I'd love to hear your thoughts. So my Practicing Creativity stamp set "Look Up" by the fabulous Courtney Baker arrived in the mail on Friday. 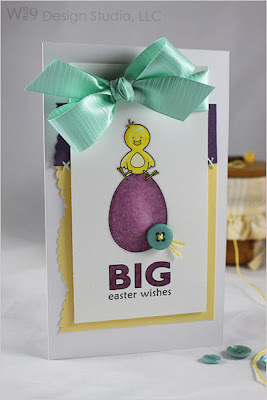 I was so excited to ink that baby up, and what better way to use it than in an Embellish Magazine challenge?! This stamp set and those colors...it was destiny. The fabric did throw me at first. But I used a 2" wide piece of twill that I had left over from some packaging for a quilt. That qualifies as fabric, right? What do you think? Super cute stamp set, huh?! And the best part is that it's by the super sweet Courtney. Now, you would think that Courtney and I would not be so "friendly" with each other. Considering the fact that we are both starting up our own stamp lines. But quite the opposite is true! I love the fact that I can email Courtney with questions and she is totally open to answering if she knows. And I'm flattered that she feels comfortable enough to email me with questions as well. I only wish we had known that we both were setting out on this adventure at the same time...we joke that we'd of made a fantastic team! I highly recommend this set and if you haven't gotten yours yet...you should! You'll be seeing more of it here. Thanks for stopping by and don't forget you still have 1 more day to play along in the current Color Cue. 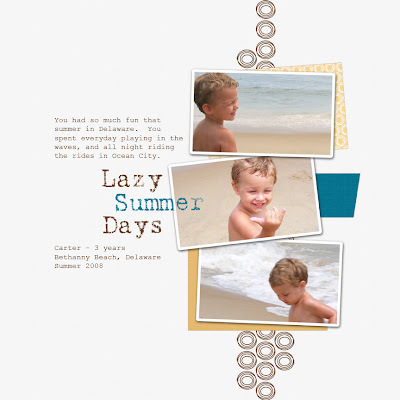 I just wanted to pop in and share a digital layout I did using the Funky Flowers Digikit. I absolutely love how this turned out, and I can't wait to go have it printed so I can hang it in his room. These are some pictures of Carter from the summer vacation we spent in Delaware. We rented a condo with my husband's side of the family and we had such a good time. I love vacationing with them. It was seriously one of the best vacations we've ever had and I think we will do it again soon. Now I just have to create another one with Hunter. I will be back later with some more posts. I finally got to ink up my set Look Up from Practicing Creativity and can't wait to share it. Hope your weekend is fabulous. Our weather is finally getting around to the Florida weather we are used to and I am loving it! I almost forgot to post this little number, until I saw it was featured on the CARDS blog today. The challenge was to create a 3x3 mini card and this guy took me under 5 minutes from concept to clean-up. 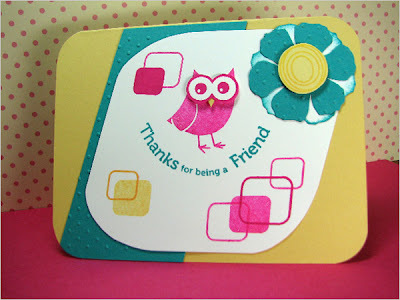 I find that when I need a quick card two colors and a nice focal image make it a snap. I chose SU! 's Real Red and PTI's Vintage Cream. 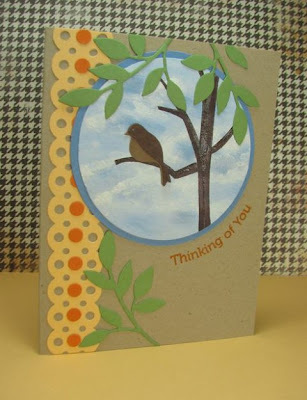 For my focal image, I used one of the tree tops and the "smile" sentiment from Funky Foliage. A simple button tied around a scrap piece of Pure Poppy PTI saddle stitched ribbon was the perfect ending. Real Red craft ink by SU! 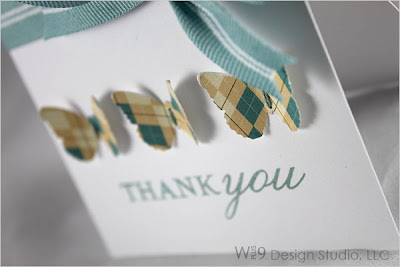 Be sure to stop by her blog for all of the details and leave her some love. Hope you found some inspiration today, whether it be from our blog friends, or from something lovely around you. Day two in Dawn's digital adventures, and I thought I'd tackle printing digital paper...and of course creating something with it! 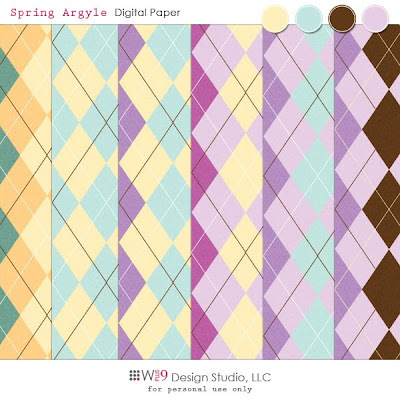 This pair of cards was created using the Spring Argyle Digital Paper Pack available now at www.wplus9.com for just $2.00! Super simple layout, as is my usual, and I pulled the colors straight from the paper. After printing the paper, I used the Martha Stewart butterfly punch, and a little DMC floss for the butterfly bodies. Notice how well that paper coordinates with existing product colors! I used SU! 's Chocoalate Chip and Baja Breeze. The two smaller prints were both printed straight from my Windows Photo Gallery. 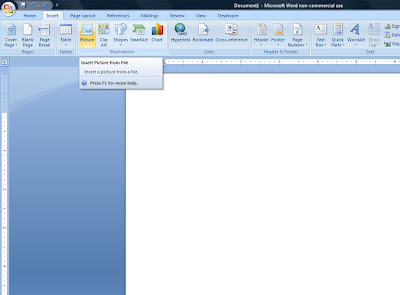 I just double clicked on the file from Windows Explorer (double clicking My Computer icon on my desktop and navigating to the file on my PC) and it opened in my Windows Photo Gallery by default. From there I chose print from the menu. 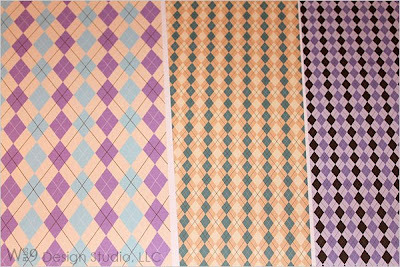 For the middle far right pattern, I chose premium paper as my paper option from printer settings. I noticed that it took longer to print and the colors came out very saturated and sharp. So for the next one I tried using plain paper as my paper option, and it came out much softer and faster. I actually prefer this as it gives the paper more of a real paper look and not a digitally perfect print. Hopefully I have helped and not confused you more. Or if nothing else, provided you something pretty to look at! ;o) Thanks for stopping by, as always, and I'll leave you with a parting shot of those butterflies in all of their argyle glory. I have a crazy eighties pop song running through my head now...great. LOL I wanted to share some digital cuteness that I am drooling over, and I don't usually go for cutesy, but hey, the heart wants what it wants. Right? Ignoring my horrid coloring skills, isn't that just the cutest little chick on the block!? Love him. 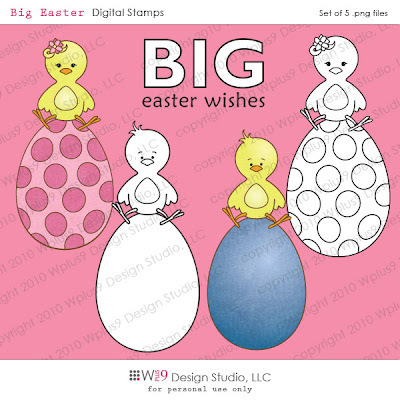 It's the boy chick from the Wplus9 Design Studio digital stamp set Big Easter now available for just $2.00. I used a mixture of prismacolor pencils (egg) and prismacolor markers (chick)to color in this image after printing. (I have some copics on order so I will share my thoughts on the differences once I get to use them.) I do like the texture the pencils added on the egg though, gives the appearance of an actual egg shell. Now I'm sure there are some hybrid newbies out there like me and I wanted to share a few screen shots of how I did it. It wasn't at all hard and over the next couple of posts I'll be sharing my experience with you in the hybrid adventures. 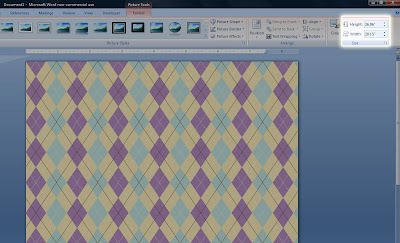 ;o) I wanted to use these files the same way I would imagine most people would, without the help of any graphics software like Photoshop or Illustrator. For this image I figured Word would be the easiest. 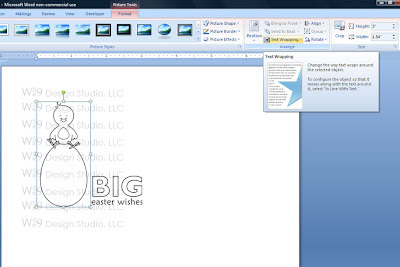 Open Word, and using a new document, go to Insert in your menu; and select Picture. 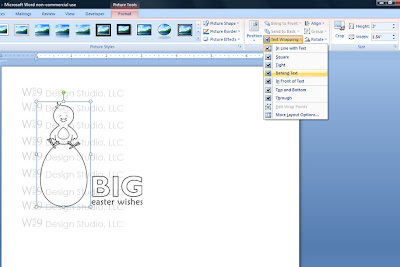 Select the picture you want to insert from your files. Click on the image below to view larger. Repeat steps until you have all of the images you want to print. For my card, this was perfect and I just hit Print, and printed on SU! Whisper White cardstock. My favorite for digi-printing, I find it to be the perfect weight especially for patterned paper. But if you want to "layer" images, that's simple to. 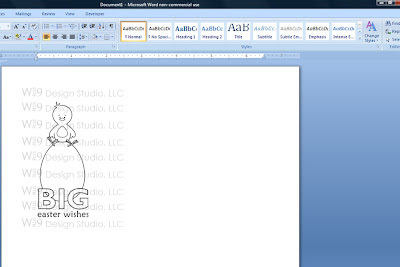 Select the image you want to be in the background and then select Text Wrapping in your menu. See image below. Select Behind Text. This will move that image to the background. Now you can arrange your images the way you'd like. 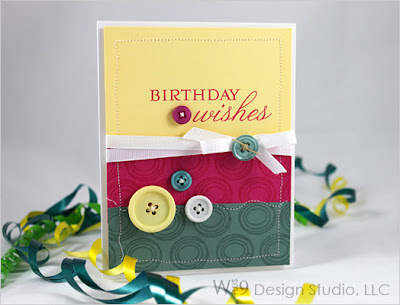 For a fantastic video tutorial visit Savitri's blog and she will walk you through step by step. Thanks for stopping in and I hope you'll give it a try! I am excited to announce that, after several requests, Wplus9 Design Studio will be expanding to include digital downloads! Each digital release will include at least one set that is complimentary to a previously released set, as well as original items. These will all be available at the Studio, www.wplus9.com Monday, March 8th for purchase. And, we will continue the excitement through the week by showing you projects created with the newest digital releases. So what do you think? Leave me a comment letting my know your thoughts, or what else you'd like to see by midnight EST tonight, and I will randomly select TWO lucky winners to recieve each of the March Digital Releases! It is my pleasure to sponsor the 23rd Just Us Girls Challenge with TWO Wplus9 stamp sets going to one lucky winner! 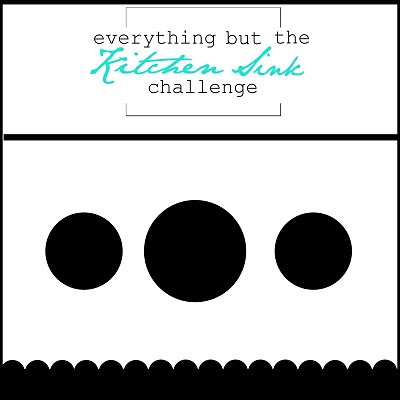 Just Us Girls hosts a fabulous challenge every week, with each week focusing on a specific category. The first of the month is always a sketch. And boy did Kristen supply a wonderful sketch. 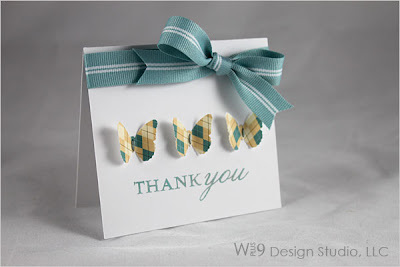 I had a wonderful time with this challenge, as did the rest of the Wplus9 Design Team. 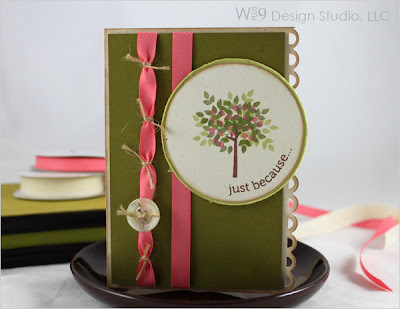 I used the Funky Foliage set to create a gorgeous spring tree ripe with flower buds. Thanks to the building pieces included in this set, this tree is a cinch to re-create. To create the leaves, I layered them using PTI Spring Moss, and SU! 's Old Olive. 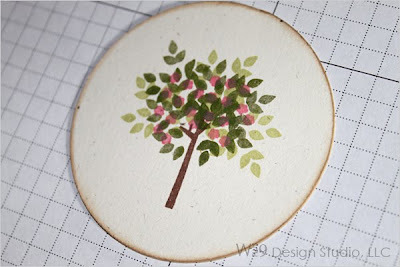 First I stamped the lighter green leaves around the outer edge creating the basic shape of the tree. (always stamp your lighter colors first when layering with ink for best results) This works out in our favor since in real life, the further something is away from you the less saturated the colors appear. Once that was finished, I filled in the rest of the tree with the darker green leaves. And Once the ink was completely dry, I came back in and added the flower buds randomly. You'll notice that for the leaves and the buds, each stamp has a small grouping of images. 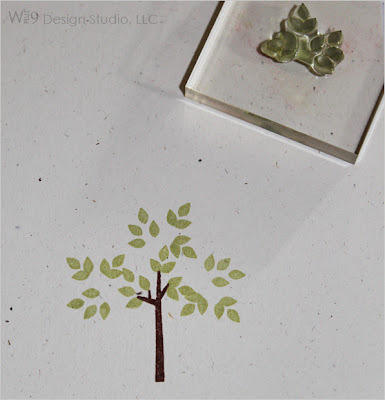 This makes quick work out of stamping, but still gives you control over the final shape and fullness of the tree. Not to mention you can then layer it with wonderful colors...think fall, this technique is gorgeous using oranges, reds, and green! Check out what the rest of the Wplus9 Design Team came up with. They always blow me away! Maile Belles also used Funky Foliage in the most inventive way and sentiments from Funky Flowers. Just look at those flowers. Swoon! Trees and flowers from the same set, you can't beat that! Savitri Wilder is rockin' the satin and lace with Funky Foliage! Check out the bow! Any more perfect and it would be illegal. Want to play along? 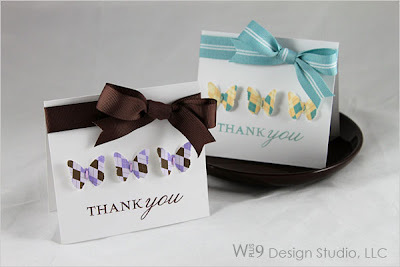 Want a chance to win TWO Wplus9 Design Studio stamp sets of your choice? 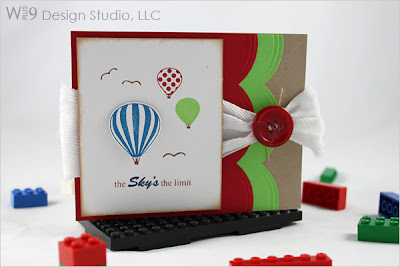 Create your own project using the sketch above and add your link to the Just Us Girls challenge blog to be eligible to win. Or just stop by to see all of the projects that the incredibly talented JUGs design team has created for this sketch. Have fun and GOOD LUCK! Just a quick post to let you know that there will be a lot of fun here on the blog this weekend starting tonight at Midnight. There will be challenges, prizes, and new releases! 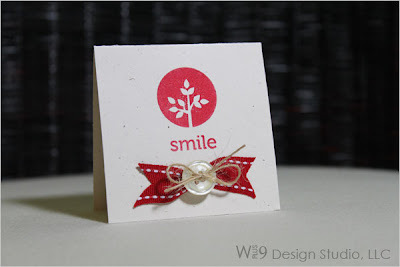 I am super excited about the newest additions to the Wplus9 Design Studio and I hope you will be as well! Also, there is plenty of time to join in the Color Cue challenge. As always, thanks for taking the time out of your day to stop by, hope it's a good one.